Like the Ocala to Osceola Corridor, the Volusia County Conservation Corridor Florida Forever BOT Project is a large-scale project seeking to maintain a viable ecological corridor through a mosaic of agriculture and developed lands. In fact, the Volusia project preceded “O2O,” and in so doing served as a model for other counties in Florida. The Volusia County Conservation Corridor exists today in large part due to the forward-thinking citizens of the county. In 2000 the county created the Volusia Forever Land Acquisition Program, which used tax revenue generated over a 20 year period to purchase and protect the county’s natural diversity. Over the past twelve years the citizens of the county have funded their own conservation programs, and through the cooperation of multiple agencies, have protected nearly 38,000 acres of habitat for wildlife and water recharge. By cooperating with federal, state, water management districts and local agencies committed to protecting natural resources, the county has stretched their funds substantially, and with good results. The protection of this property has major implications for Florida’s biodiversity at the landscape level. Aside from providing habitat for sensitive species, and indeed for whole communities of plants, the Volusia Conservation Corridor provides a continuous corridor of environmentally significant land from Tiger Bay State Forest, through the central marshes and pine flatwoods of Volusia County, all the way to the marshes of the St. Johns River. 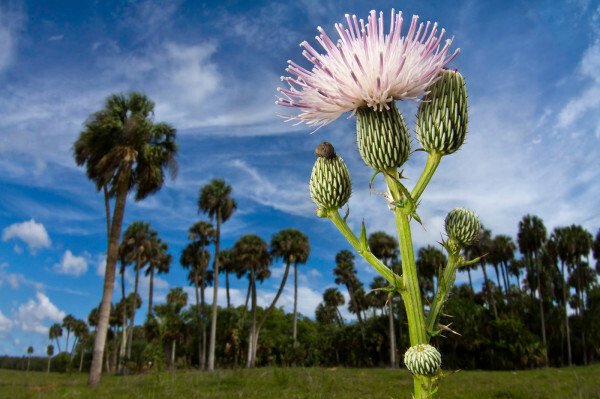 There are few landscapes in Florida that are more in need of protection. Volusia County, it could be argued, is scaled-down version of the entire state of Florida, where sudden pressure from development along the coastal boundaries threatens to stifle a landscape that for millennia has teemed with life and endless ecological processes. On the western boundary of the county is Ocala National Forest, a 383,000-acre multi-use landscape full of freshwater springs and endemic plant-rich sandhill and scrub habitats. To the south the St. Johns River and its complex of conservation land snakes up the Atlantic Coast. Between the two massive conservation hubs lies the sprawling city of Orlando. The Volusia Conservation Corridor provides a route around the city to the east, between Orlando and Daytona, to the protected stretches of the St. Johns, south of State Road 46. Ocala National Forest supports an increasing Florida black bear population. The Volusia Conservation Corridor is vital feature of the conservation and management of the Ocala black bear, ensuring additional habitat for dispersing juveniles. This is important for the statewide conservation of the black bear, which must be able to travel and breed between disparate subpopulations in order to maintain genetic health. Conservation land along the St. Johns River provides a good travel corridor between Ocala National Forest and the Wekiva Basin west of Deland, but the expanding footprint of Orlando and its outlying communities impede movement further south. Other wide-ranging species that are affected by the development of the central Florida peninsula stand to benefit from the protection of the Volusia Conservation Corridor. If the Florida panther is to one day expand its range into Ocala National Forest and beyond, it is most likely to use the corridor that has been implemented in Volusia County. Indeed, multiple male panthers have been documented in the corridor in recent years. The Ocala National Forest to Volusia landscape is a high priority Critical Linkage, similar in scale and regional significance to the Fisheating Creek to Big Cypress linkage. It is perhaps the most threatened by development, with growth pressure encroaching from Orlando, Deland and Daytona. Interstate 4 is in the process of being widened, and State Road 415 is under consideration for a widening project. Wildlife underpasses should be incorporated into any road projects that intersect the Volusia Conservation Corridor, in order to ensure that these roads do not become impermeable barriers to wildlife.